"Hey Andrea, you've been back for more than two weeks and you still haven't written about San Francisco!" So: six days in sunny San Francisco. I liked it. It reminded me a lot of Australia - certain parts of the city itself seemed quite Melbourne-ish while the cliffs and ocean vistas were very Sydney. Besides that, I had great company and yummy food. Here's the day-by-day summary, with more detail than you wanted. -lunch at a place called India Clay Oven on Geary Ave. Yum! -Sutro Heights Park. Cliff, view, eucalyptus trees, ocean. Nice. 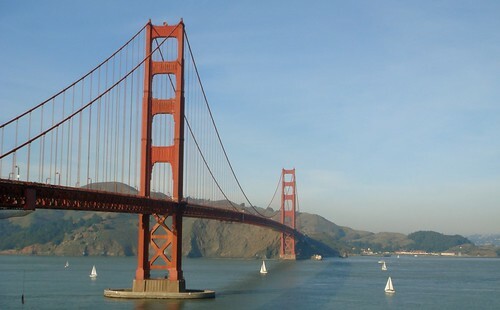 -Golden Gate Bridge! Baker Beach! The Presidio! -to ensure my maximum discomfort on the flight home, we scarf roti and beef rendang at Banana Island in Daly City. -Good bye SF, good bye and thank you, H.! There are a few more photos here. Also, if you can't tell already, I'm really into the citizen review site Yelp these days. Can't wait until I can 'yelp' about my favourite places in Toronto.